A Spell is a game mechanic added by the Blood Magic mod. There are two different types of spell: simple spells, that are simple to setup and less resource intensive, and complex spells that are more difficult yet more flexible and powerful, which allows the Player to mix and match spell effects. What self-respecting blood mage would leave his lair of awesomeness unprepared? Where sigils are very good for strong static spells and upgrading armor, they pale in comparison to the variability of spells! The process can be complicated, so let's not delay! It all starts with the Spell Table. It is laced with many alchemical properties given to it from a simple Apprentice Blood Orb, yet it cannot work alone, it needs a paradigm and a Spell Focus, which can be any mundane item, such as a block of ice or TNT - slot it into a Blood Altar right next to the Spell Table, and then move onto the next step. Keep in mind that the Focus gives the spell a certain element - the ice may make things a little chilly! 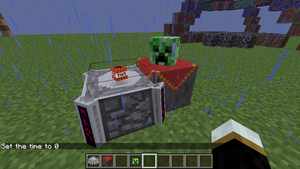 The "Paradigm" takes the form of a monster head, and it denotes the different capabilities that are given to the spell: a simple Skeleton skull denotes Offensive-Ranged, a Wither Skeleton skull gives an Offensive-Melee spell, a Zombie head will allow the Defensive capabilities of the spell to shine, and a Creeper head will allow Environmental spells. Once that is done, you need to create an Unbound Crystal and right-click with it onto the spell table. A piece of glass in a 2nd tier Blood Altar (with 1000LP) will give this crystal, and it is used to cast the spells. These crystals can be renamed, so as you don't forget what the spell does! Looking for a mob head, but can't find one? Combine a Wither Skeleton skull with a piece of the monster that you wish for, and you can create it with your alchemical power. Through your workings with Blood Magic you have found a way to construct simple spells out of a simple spell table, a skull, and an altar to create an in-world spell. However, toying with the Ritual of Binding has given the Blood Mage a few interesting ideas: What would happen if you were to bind the power of Demonology and mix it with your own alchemical experiments? Your lust for power has brought you to the pinnacle of spell creation. Similar to the "static" spell system, this system has four main components as well as a new spell crystal. These four things are: Paradigms, Effects, Modifiers, and Enhancements. All four of these spell effects are represented as blocks placed in-world, and depending on how you chain them together you can get various spells. Paradigms are the initial block in any form of spell chain. When you use one of these blocks in your spell, it designates what type of spell it will be. For reference later, the 5 points that are coloured (on the top, but can be rotated) is the output of the block. Spell Effect Generators are the blocks that add a particular element to the spell that you are casting. For instance, if you were to add the Crucible of Fire to the spell chain you will make your spell have some sort of fire aspect on it. These Spell Effect Generators do stack, however: if you add fire and then ice to your spell, with a few modifiers to shape them (more on that later), you can have a fire and ice effect on the spell. The coloured ends of the block represents the output of the block, and the non-coloured 5-point arrangement (bottom of each block, but are orientable) are the inputs. Spell Modifiers are what shape the spell effects into a more focused direction. Here we have: Default, Offensive, Defensive, and Environmental. When a Modifier is placed in a spell chain at the output of a Spell Effect, the latest effect in the chain will be modified into one of the four different types. So, if you place an Offensive modifier right after an Ice effect block, it will force the ice effect to become offensive in nature. Note that the modifier will only affect the effect that is latest in the chain: any previous spell effects will not be affected. The coloured end of the block is the output, and the stone ring is the input. Spell Enhancements are meant to enhance the spell effect's various properties. The 3 that are currently in are: Power, Cost, and Potency. If you add in one of these blocks in the spell chain after a spell effect, it will apply the benefits onto the effect. So, if you add a Power-type (red core) enhancement block, it will make your spell more powerful at the task it is given. A Cost-type (green core) will reduce the cost of the spell, and a Potency-type (blue core) will cause the effect to be much more potent. When adding in the enhancements to the spell, you should note that the frame of the block matters. The Unstable blocks will only allow one of its type onto the particular effect - Trying to add 2 Unstable power-enhancements will cause only one of them to register (and possibly cause the other to blow up, breaking the spell chain). You can, however, have one of each Unstable Power, Cost, and Potency block for the effect, but it will be limited to 1 of each type. Standard enhancement blocks will have a limit of 2, and Reinforced 3. Once again, coloured end is output, and not-so-colourful end is the input. Conduits don't really do anything. All they do is transfer the spell from its input face (four dots) to its output face (one dot) unaltered. If you want to have your spell in such a way that a lot of the components are far apart, you can use these and orient them to continue the spell. In this section you can find a small description of the resulting spells for every combination of paradigms, effects and modifiers. Turns the Complex Crystal into a Mace. The attributes of the mace depend on the paradigms etc that are used. If killed from lack of LP while using spells, you will drop all items, regardless of item drop settings.